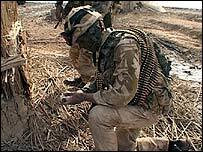 An independent inquiry has concluded thousands of UK Gulf War veterans were made ill by their service. The inquiry said there probably were a number of causes - but said it was fair to describe the illnesses collectively as Gulf War syndrome. It called on the MoD to establish a special fund to make compensation payments to veterans of the 1991 conflict whose health had been damaged. The inquiry was headed by the former law lord Lord Lloyd of Berwick. It was funded by private parties who do not wish their identity to be exposed. 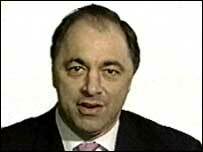 Veterans Minister Ivor Caplin criticised a lack of transparency behind the report's funding. About 6,000 veterans of the conflict are believed to be suffering from ill-health. However, despite paying pensions to thousands of veterans, the MoD has never accepted that their illnesses are linked to their service. The inquiry report said all the scientific studies agreed Gulf veterans were twice as likely to suffer from ill health than if they had been deployed elsewhere. It accepted the illnesses suffered by the veterans were likely to be due to a combination of causes. Stress may have been a contributory factor, but could not alone explain the illnesses. Further research was needed to try to pinpoint the causes more precisely, the report said. However, that was no reason for the MoD not to accept that the illnesses were the result of service in the Gulf. Announcing the findings of the inquiry, Lord Lloyd said: "What the veterans now want above all else is a clear recognition by the MoD that they are ill because they served in the Gulf. "Are they entitled to that recognition? In our view they are." Lord Lloyd said many veterans had been told they were not ill, and that their problems were all in the mind. "A small proportion of those who are ill have the classic symptoms of post traumatic stress disorder, but this could not account for the great majority of those that are ill," he said. Any doubt had been removed by a top-level US report published earlier this month, he said. "It is not acceptable for the MoD to say 'yes you are ill, but since we do not know which of the possible causes has caused your particular illness, we are not going to admit your illness is due to your service'." Lord Lloyd said even though the illnesses suffered by the veterans were probably caused by a variety of factors, there was no medical reason not to describe their ailments collectively as Gulf War syndrome. "People who are ill like to have a name for their illnesses. Rather than tell a child that his father died of symptoms and signs of ill-defined conditions, it is surely better to tell him that he died of Gulf War syndrome." The inquiry was set up at the request of Labour peer Lord Morris of Manchester, the parliamentary adviser to the Royal British Legion, after the MoD refused an official inquiry. The MoD refused to allow serving officials or military personnel to appear before the inquiry although it did submit written evidence. However, the inquiry was still able to take evidence from former personnel including the commander of the British forces in the Gulf, General Sir Peter de la Billiere, scientific experts, and some 35 veterans or their families. Tony Flint of the National Gulf Veterans and Families Association said the report conclusions justified what the veterans had been saying about Gulf war syndrome for years. He said it was now time for the MoD to take heed of Lord Lloyd's proposals and compensate the veterans for the illnesses they have suffered. "We've said all along that it exists now we have an eminent body saying it as well. "We call on the Ministry of Defence to accept the conclusions of the committee and take on board its recommendations." Veterans Minister Ivor Caplin said: "What I need to with officials at the Ministry of Defence is to give the report proper consideration. "I have always said, as has the government, that there are Gulf veterans who are ill. That's never been denied. Lord Lloyd consistently refuses to tell us how this inquiry was funded. "What I'm keen make sure we do is ensure that there are the right levels of pension support and benefits given to veterans. That's what is important." He said more research was needed and questioned the financial backing behind the independent inquiry. "It didn't have the backing of government. "There's concern that whilst we as a government have been completely open with the Gulf veterans since 1997, that Lord Lloyd consistently refuses to tell us how this enquiry was funded. "He should be open and transparent." 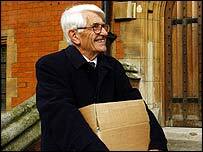 Ian Townsend, secretary general of the Royal British Legion, said: "We asked for an independent public inquiry. The government denied us that. "What we have actually got is as independent an inquiry as we could possibly have got and I do not think anyone could have been more independent than Lord Lloyd."